DENVER ” Towns throughout the Rocky Mountain West that oppose mines near water supplies and scenic areas are backing efforts to revamp a federal law regulating hard-rock mining that’s changed little since Ulysses S. Grant was president. A bill passed by the U.S. House in November would impose the first-ever federal royalties on gold, silver, copper and other metals mines, beef up environmental controls and give federal agencies the ability to say “No” to a mine that would irreparably harm the environment. For many, that last part is the heart of the bill. Under the 1872 law, federal agencies can scrutinize a company’s plan and require environmental safeguards. But they can’t decide, as they can with oil and gas drilling, that no development should occur in a certain spot. The bill, H.R. 2262, the Hardrock Mining and Reclamation Act of 2007, faces a rougher time in the Senate. It would allow local, state and tribal governments to petition the federal government to withdraw certain lands from the filing of new mining claims. Industry officials say they don’t oppose updating the law, or even charging royalties. But they insist that the House bill’s fees would be punitive and that provisions allowing denial of mining claims would hurt the industry. Prices for many of the metals covered by the hard-rock mining law – gold, copper, uranium, molybdenum – have surged in recent years as worldwide demand has increased. “Let’s don’t literally kill the golden goose that’s supplying our country with the metals and minerals we need,” said Luke Popovich, spokesman for the National Mining Association in Washington. But proponents say it’s past time to overhaul a law originally intended to encourage settlement of the West. “It’s the last of the great dinosaurs from the 1800s,” said Roger Flynn, director of the Colorado-based law firm Western Mining Action Project. Pima County and local governments have passed resolutions against a copper mine proposed by Augusta Resource Corp. in the Santa Rita Mountains southeast of Tucson because of concerns about water and air quality and potential impacts on tourism. Sen. Ken Salazar, D-Colo., supports mining reform that includes a so-called Good Samaritan provision that would protect groups or companies willing to clean up abandoned mines from legal liability under the federal Clean Water Act. There are about 500,000 abandoned mines nationwide, some dating to the 1800s, according to federal statistics. Lead, arsenic and other metals from some of the mines have contaminated lakes and streams. Cody Wertz, Salazar’s spokesman, said Salazar is working with others on a version of the bill that can pass the Senate. “Royalties is one of the areas where they’re trying to find some compromise,” Wertz said. Since 1872, according to the Washington-based environmental group Earthworks, at least $245 billion worth of gold, silver, copper, uranium and other metals have been mined on public lands with nothing going to taxpayers. Popovich said the proposed royalty of 4 percent of gross revenue on existing operations and 8 percent on new mines would be among the highest worldwide in a country with some of the highest wages and costs. Industry officials and Senate Majority Leader Harry Reid, D-Nev., prefer Nevada’s system, which charges royalties on net income. The 1872 law also allowed people to patent – or buy – public land for mining at the rock-bottom prices of $2.50 to $5 an acre. There’s been a congressional moratorium on patents since the mid-1990s and the House bill would permanently eliminate them. For Flynn, the crux of the bill is authorizing federal agencies to balance other values – the environment, economics – with mining. Currently, hard-rock mining trumps all other uses, he said. That’s how Crested Butte Mayor Alan Bernholtz sees it. Flynn’s law firm represented the town, Gunnison County and the High Country Citizens Alliance in challenging a proposed molybdenum mine on the summit of Mount Emmons. 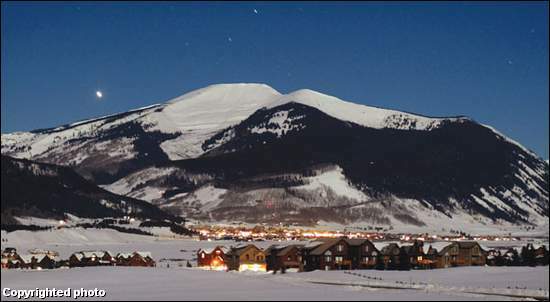 The peak, also called the Red Lady for the color of its rocks, towers over the ski community of Crested Butte in western Colorado. Bernholtz said mining is no longer a good fit with the area’s tourist-based economy. He’s also concerned about environmental impacts, including drinking water sources. Federal courts rejected the lawsuit, which challenged the sale of federal land on the mountain to private companies. The 10th U.S. Circuit Court of Appeals in Denver ruled that only people with a competing claim to ownership can challenge such sales, and the U.S. Supreme Court declined to hear the case. “The last thing we want to do is scar it, hurt it, taint it,” Keith Larsen, chief executive and chairman of U.S. Energy Corp., said of Mount Emmons. His company, based in Riverton, Wyo., is in the “very, very early stages” of plans for the 155 acres acquired from the federal government. Larsen said he believes the molybdenum can be mined in an environmentally sensitive way while generating jobs. And he said he fears the House bill will send mining companies to other countries in search of minerals and metals.